Get up close and personal with tropical fish in Bora Bora lagoon. Scuba along beautiful coral with a qualified diving instructor. Indulge in relaxing spa treatments. Spend nights in your luxurious overwater bungalow. Experience paradise personified with this Polynesian getaway to soul achingly gorgeous Tahiti & one of the most romantic destinations in the world, Bora Bora. Wake up each day & plunge into your ocean view from your private luxury overwater bungalow. Stroll tranquil beaches, cruise across shimmering waters, dive in underwater utopias, sail reef fringed islands, visit an exotic Tiki village & more. The ideal fusion of relaxation & entertainment, enjoy culinary feasts, dazzling cultural performances, surprising tropical treats, or simply sit back & relish doing nothing at all. Featuring a celebrated resort on a private island, private guide, driver, boat cruises, internal flights & more! Prepare for an adventure in paradise. 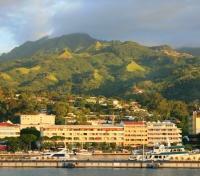 You will be privately transferred between Papeete Airport and your accommodations by a professional driver. 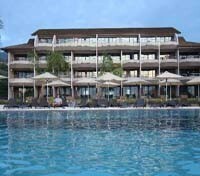 Opened in March 2009, the Manava Suite Resort Tahiti promises to be the premier Papeete resort for business and leisure travelers alike, offering 121 guest rooms ranging from rooms to multi-bedroom duplex suites and Manava Suites. With state-of-the-art technology and in-suite kitchen quarters, each room will offer a luxurious, well-appointed home base for travelers of all kinds, from business travelers staying for a week, to leisure travelers en route to the outer islands. 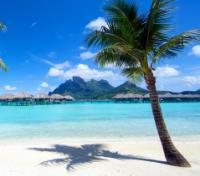 Enjoy this one way direct flight from Papeete to Bora Bora. The flight time is approximately 50 minutes. A private boat transfer between the airport or pier is provided today. Sofitel Bora Bora Private Island occupies an island all of its own. Along with magnificent views of Bora Bora and its famous lagoon, it features 31 luxurious and refurbished beachside, water or hillside bungalows which face beautiful Mount Otemanu. Sample the exquisite restaurant, relax over a cocktail in the outdoor bar or experience the unique 'cigar cave' and fine wine cellar. 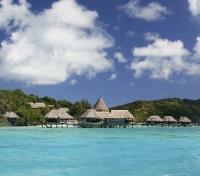 Recreational facilities and a day spa are a short boat trip away at nearby Sofitel Bora Bora Private Island resort. This is the best way to explore the marine flora and fauna, and is suitable for swimmers of all levels. Your qualified diving instructor will instruct you whilst guiding you to explore the beauty of the coral gardens. 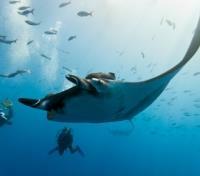 You will also get a chance to see leopard and manta rays during visits to different protected sites on board your comfortable boat. If you are here to relax or seeking for adventure, Bora Bora has many memorable, one of a kind experiences to offer; great beaches and a fantastic selection of water sports are awaiting your arrival. The newest sport to hit French Polynesia in the past 50 years has to be kiteboarding. 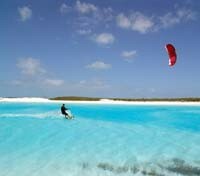 The French call it Flysurfing, and it's also known as kitesurfing. The winds are excellent and for the most part dependable, and there are a few decent spots to launch from shore. There is also lagoon swimming, jetskiing, and world class scuba diving to name a few of the water activities. Try some of the local or wonderful French cuisine that the island has to offer. Take a walk around the beautiful island. The trail system is good and can easily be experienced in only a day or two of non-strenuous hiking. 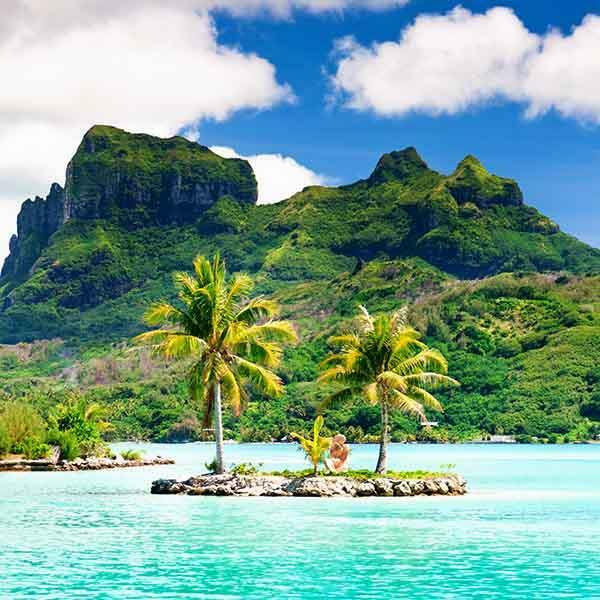 SHARED DAY TRIP :Get up close and personal with tropical fish, stingrays and blacknose sharks in their natural habitat, the beautiful Bora Bora lagoon, from the decks of the charming Cap Camarat Bayliner. Shared day trip. Bloody Mary's is one of Bora Bora’s most popular restaurants and has welcomed many Hollywood stars to its typically Bora Bora interior. Sink your feet into the sand and indulge in an exotic cocktail with a house special of fish and seafood. 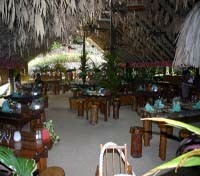 The dinner includes an appetizer, a main course served with tossed greens and steamed rice, and a fresh fruit desert. Enjoy your one way direct flight from Bora Bora to Papeete. The flight is approximately 50 minutes.